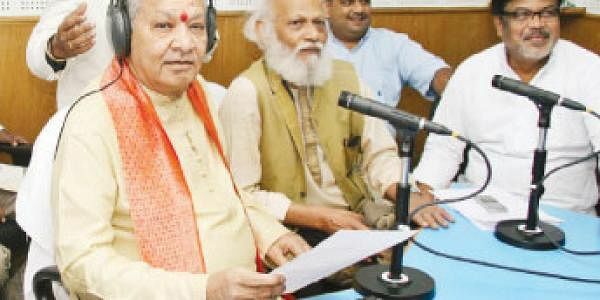 Siksha-O-Anushandhan (SOA) University’s initiative of community radio ‘Voice of SOA Community 90.4’ was inaugurated by renowned flutist Hariprasad Chaurasia on Monday. It is the fifth in the State and first in the Capital city. It has been created at a cost of Rs 35 lakh. The initiative is aimed at benefiting the community in and around the university by creating awareness about current affairs. Chaurasia remembered his days as a composer and performer at All India Radio (AIR), Cuttack. “I am privileged that the honour of inaugurating the community radio was given to me. My stint at Cuttack’s AIR station was an important part of my life. But I am saddened to hear that it is on the verge of closure. On the one hand it is a beginning for ‘Voice of SOA Community 90.4’ and on the other a closure for AIR Cuttack,” said Chaurasia. Painter Jatin Das spoke about a balanced give and take between the community and the college. “The nearby places of the college should feel uplifted due to the community radio of the university. The people should avail of the benefits that the community radio will bring about,” said Das. The community radio can broadcast within a range of 20 km. Actor Bijay Mohanty said, “The community radio will be a catalyst for a mini revolution by creating a basic awareness.” He added that it would serve as a unique platform for the college students to showcase their talent. The concept was unanimously appreciated by everyone present at the event. MLA Ashok Panda, National Cricket Academy chairman Ranjib Biswal and SOA university Vice- Chancellor RP Mohanty were present. A welcome message by all the guests would be broadcast.